This compact soundbar is perfect for TV, computer, notebooks, with strong stereo and saving space. With a 3.5mm audio cable, u can connect the soundbar to your any devices with 3.5mm audio output port, and enjoy the lossless sound muisc and movies. Enjoy wireless audio streaming with the black Samsung HW-KM45C 2.1-Channel Soundbar System. Bluetooth connectivity is built into the soundbar for wireless audio streaming from devices like MP3 players, smartphones, and tablets. Samsung HW-MM55C/ZA 3.1 340W Channel Soundbar with Wireless Subwoofer (Certified Refurbished). 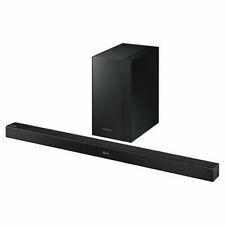 This SAMSUNG 340w 3.1 Channel Soundbar with Wireless Subwoofer is in great working condition. 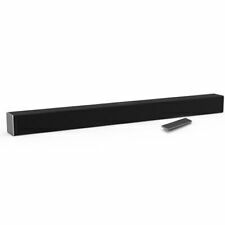 SAMSUNG 3.1 Channel Soundbar with Wireless Subwoofer HW-MM55C/ZA Specifications. FREE SHIPPING!! Buy Refurbished DIRECT from POLK AUDIO! The bluetooth speaker made of premium material for durable and practical use is with unique appearance and high quality sound effect. Besides, it is a light weight and with mini size, you can take it with wherever you go. The IP-08 Wireless SoundBar with Bluetooth let you enhance your TV experience with crisp dynamic sound. This model is designed as a small sound-bar to improve the audio quality of small flat-panel TVs but it also functions as a normal portable Bluetooth speaker for your laptop or phone when required. Brand Unbranded/Generic MPN BT-ET018 Form Factor Soundbar Configuration 2.1 System Connectivity Bluetooth/Wireless Audio Inputs Digital Coaxial RCA Subwoofer Type Passive RMS Power 90W Sound Quality High Fidelity (Hi-Fi) Surround Sound 2.1 Channel Color Black Shape Horn Speaker Design 2-way Country/Region of Manufacture China UPC Does not apply. High efficiency design creates full, spacious, clear sound with as little as 20 watts. Speakers have 4" woofer and 1" tweeter, titanium coated and other components. 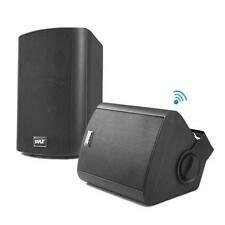 These speakers have a modern design with the non-resonant MDF enclosures with PVC. Attention: This soundbar can be connect to your TV with a 3.5mm audio cable(connected), please make sure that your TV has a 3.5mm audio output port. Feature: 21-Inch 20 Watt 4.0 Channel AUDIO Soundbar Completes your home theatre system with 4 full range high quality speakers, offering the powerfull sound, and with the outlet design, bring your the passtive bass and clear stereo sound quality. WIRE OR WIRELESS CONNECTIONS Modern and traditional devices work with the speaker thanks to Bluetooth (effective distance:10 meters/33 feet) or wired connections that include 3.5mm AUX input A MODERN LOOK. Feature: 【REMOTE OPERATION】Playback settings can be conveniently adjusted via either the buttons on the bluetooth soundbar or by using the remote control, just sitting on the sofa and enjoy the amazing music or movie. 【EASY TO SETUP】The TV soundbar can be placed horizontally on the TV cabinet or mounted on the wall for an elegant setup that reduces clutter and saves space. No matter where you choose to place it, rich clear sound will reach the entire room. .
Read More. one speaker Cone pushed in. You'll feel it. Wireless surround sound ready. Note: As a passive (not active) subwoofer, the GS50 does not accept a single Subwoofer or LFE (Low Frequency Effect) line as an input. With a built-in crossover, the GS50 is designed to accept standard stereo inputs and will automatically separate the different bands of audio frequency. 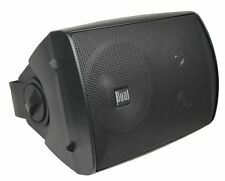 ★ PRORECK sound-enhanced line array speaker sets includes two line array speaker(each is made of four identical speaker) and connecting cables. ★Eight tweeters and eight midiants ensure clear and bright sound; Each array speaker has 4ohms output, and the two has 8ohms in total. Black ebony woodgrain vinyl finish. The Reference Premiere models have updated drivers and a new crossover system for even more spacious sound. Owner's Manual. 2 Black two-way bookshelf loudspeakers. It has been tested and works as expected. This wireless soundbar with BT allows you to enhance your TV experience with crisp dynamic sound. Support BT connection, compatible with most BT devices, for convenient wireless playing. Built-in DSP sound processor with clear sound and no noise. The system has inputs and outputs for left, right and center speakers. Cabinet is in great shape with only a few small flaws.